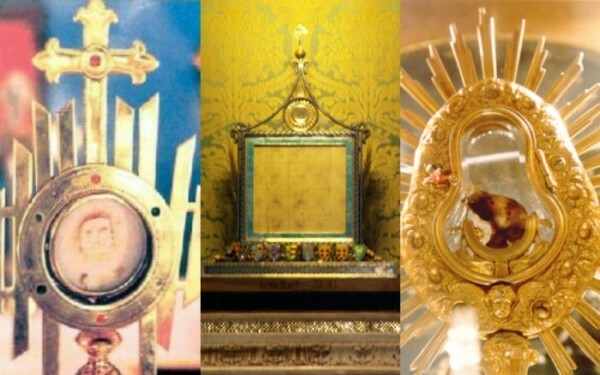 Catholics believe that Jesus Christ is really, truly, and substantially present in the Eucharist. There are many stories of miracles throughout Church history that seem to confirm this important teaching. It’s important to note that no Catholic is required to believe any of these stories. Even if they have been investigated and approved by the Church, the Church does not give any absolute guarantee to their authenticity. Nor does the Catholic dogma of transubstantiation depend on the authenticity of these stories (it is based on Scripture and Tradition). Nonetheless, these stories are particularly noteworthy since you can still go see evidence of the miracles today. 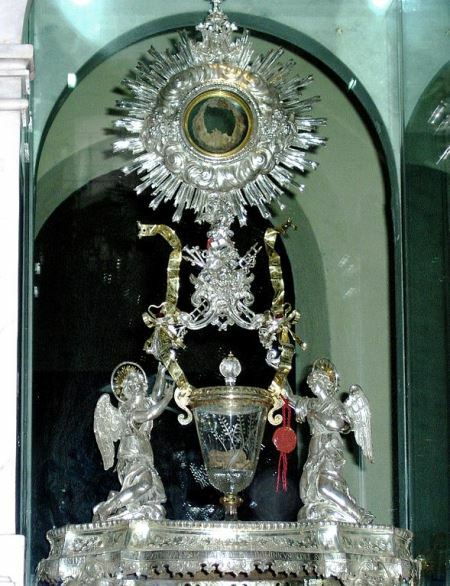 In the 8th century, a priest in Lanciano, Italy was experiencing doubts about the real presence of Jesus in the Eucharist. In the middle of saying Mass, he said the words of consecration (“This is my body,” “This is my blood) and saw the bread and wine transform into real human flesh and blood. The blood coagulated into five globules (later believed to be representative of the five wounds of Christ). Word of the miracle quickly spread, the local archbishop launched an investigation, and the Church approved the miracle. The flesh is still preserved to this day. Professor of anatomy Odoardo Linoli conducted a scientific analysis of the flesh in 1971 and concluded that the flesh was cardiac tissue, the blood appeared to be fresh blood (as opposed to blood that was 1200 years old), and there was no trace of preservatives. 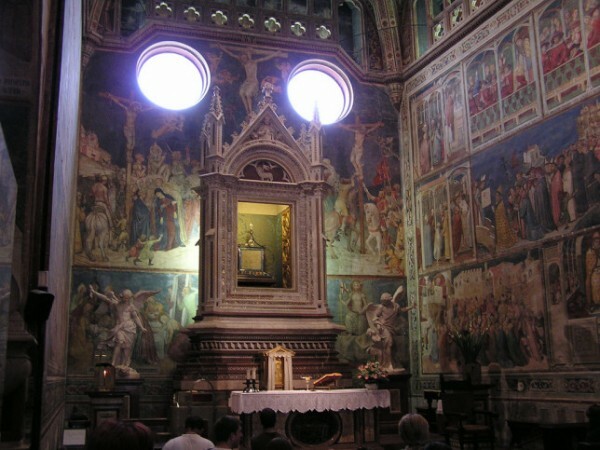 You can visit the miraculous flesh and blood in the Church of San Francesco in Lanciano, Italy. A priest who had been experiencing doubts about transubstantiation was celebrating mass in Orvieto, Italy. Soon after he had consecrated the Eucharist, the host started bleeding onto the corporal (a liturgical cloth) on the altar. The priest, the story goes, ran to the pope who was visiting the town and confessed his sin of doubt. 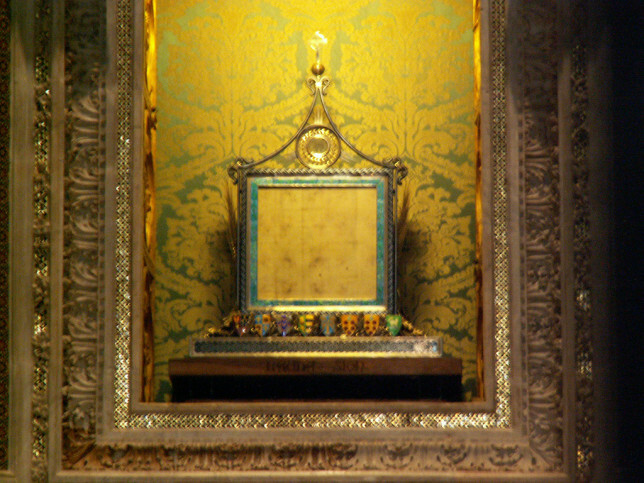 The corporal remains on display in the Cathedral of Orvieto. Some historians, however, question the veracity of the story, since the first accounts of it don’t appear until about a hundred years after the miracle supposedly took place. 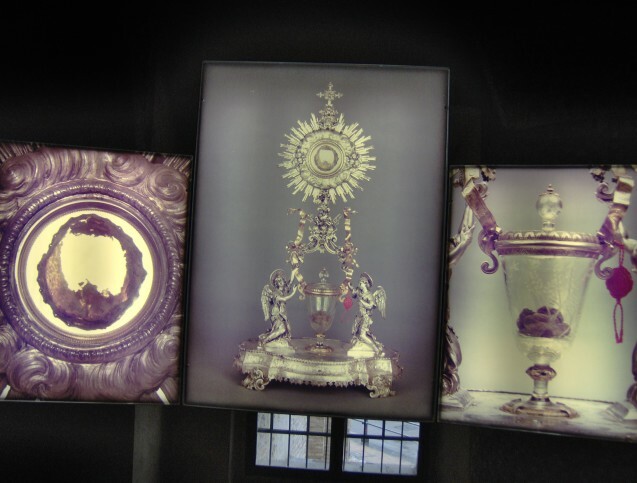 Nonetheless, the corporal remains an object of veneration. A woman living in Santarém, Portugal in the 13th was distressed that her husband was unfaithful to her, and she decided to consult a sorceress for help. The sorceress told her the price of her services was a consecrated host. She went to Mass at the Church of St. Stephen and received the Eucharist on her tongue, removed the Eucharist from her mouth, wrapped it in her veil, and headed to the door of the church. But before she got out, the host began to bleed. When she got home, she put the bloodied host in a trunk. That night, a miraculous light emanated from the trunk. 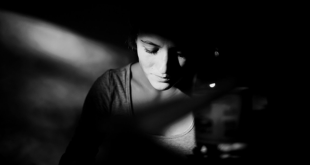 She repented of what she had done and the next morning confessed to her priest. Her priest came and retrieved the host and took it back to the church. 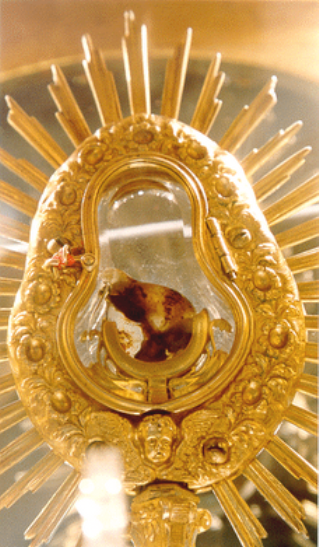 After an investigation and approval of the miracle, the church was renamed Church of the Holy Miracle, and the bloodied host remains on display to this day. 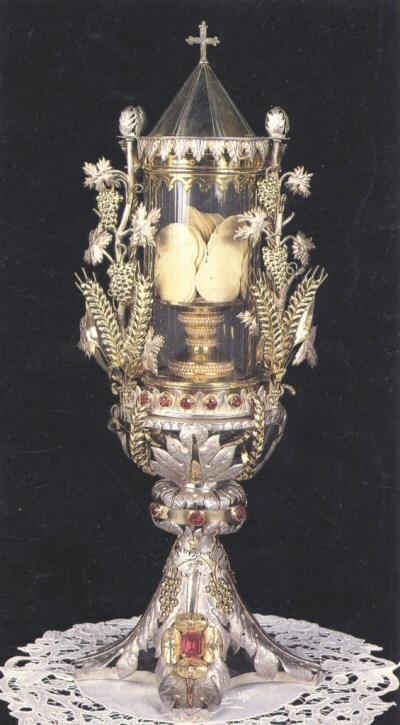 On August 14th, 1730, while the Catholics of Siena, Italy were attending a special festival for the eve of the feast of the Assumption, thieves entered the Church of St. Francis and stole a golden ciborium containing hundreds of a consecrated hosts. Two days later, someone noticed something white protruding from the offering box at another church in Siena. The priests opened the box and found the missing hosts inside, entangled in cobwebs and dirt. 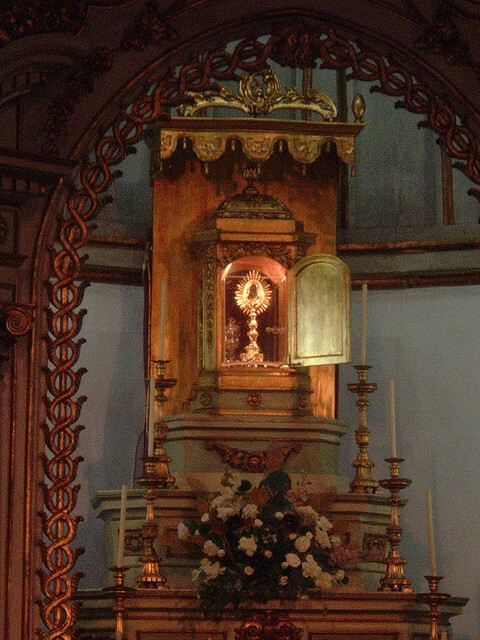 After being cleaned as much as possible, the hosts were placed in a new ciborium and taken back to the Church of St. Francis for prayers of reparation and veneration. Since the hosts were dirty, the priests decided not to consume them but let them simply deteriorate. Over the next few decades, everyone was amazed to see that the hosts did not deteriorate, but actually appeared fresh. The hosts remain in this state today, 285 years later, and can still be seen in the (now) Basilica of St. Francis in Siena, Italy. 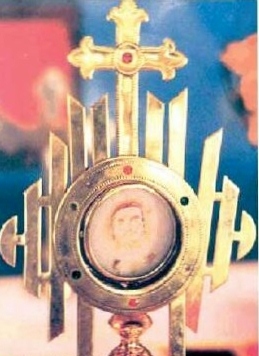 On April 28th, 2001, there was Eucharistic adoration at St. Mary’s parish in Chirattakonam, India, when suddenly three red stains materialized on the host. The priest didn’t know what to do and placed the host back into the tabernacle. A few days later he retrieved the host to examine it again, and the red stains had arranged themselves to look like the face of a man (Jesus?). He quickly found a photographer and had pictures taken of the host.